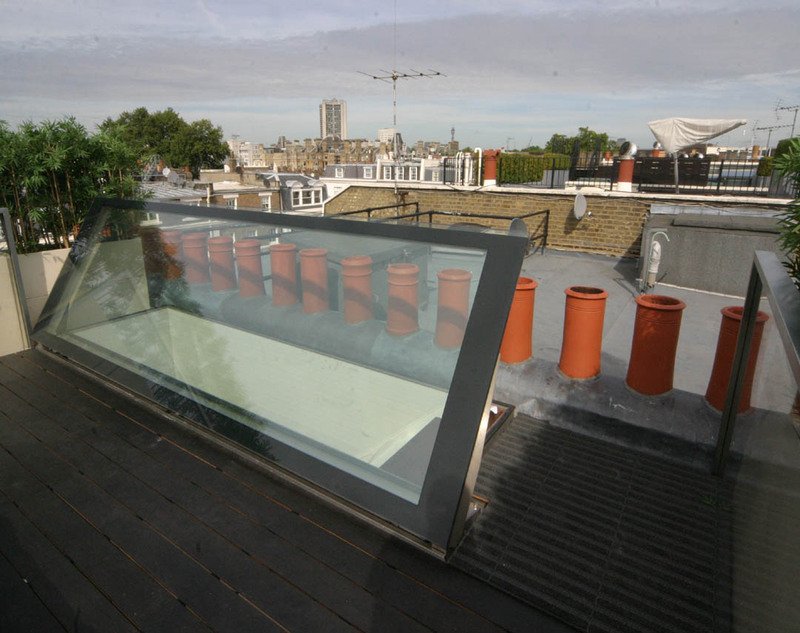 This opening hinged roof access is installed over a staircase to allow access to a roof terrace. With its single piece of glass it allows maximum light to flood into the house below. Pressing the open button at the base of the staircase starts the 20 second opening cycle. By the time you reach the top of the stairs the rooflight is open and acting as a balustrade. Closing takes around the same time but includes a safety beam to prevent people or objects being trapped. The glass is walk-on, so for busy parties the roof can be closed to gain maximum entertaining space. Or perhaps it could be closed whilst watching city wide thunderstorms. The closed height of such a system can be designed so it is flush to the top of the decking. It can be adjusted so the ‘final step up’ from the staircase onto the decking matches the ‘riser height’ of the rest of the staircase. As a hinged unit it needs no valuable roof terrace area to open into as a sliding roof would, with the added bonus of the open roof acting as the necessary safety balustrade. The result is that for concerned planning departments there are no unsightly permanent protruding handrail structures on the rooftop. By using powerful hydraulic rams we can keep the mechanisms very compact so the passage from the stairs out onto the roof is not obstructed by the opening mechanism. The power pack case is mounted on the roof inside the false bottom of a planter for a discreet appearance. There is also an emergency manual back-up pump to allow the 650kg roof to be closed or opened, as desired, in case of systems or power failure. This hand pump is mounted under the stairs to provide easy access in the unlikely event of it being needed. When closed, the frame rests outside the hole and is not visible from beneath. This means onlythe glass is visible, giving a clear sky view at all times. This roof has a combination of cill flashings on 3 sides and a gulley against the party wall. The result is a clean, neat external space, unencumbered by visible equipment. We can provide similar bespoke stainless steel flashings and guttering to suit most applications.